Stylish hipster cafes may steadily be on the rise in Chinatown but that’s not to say that they’re pushing the older players out. This Chinese New Year (Feb 5), head to one of these charming traditional haunts for a taste of old-style condensed milk coffee, custardy kaya toast and prices straight out of the 1950s. This historic cafe has been around for almost 70 years. Head here to sample their Thai-style traditional blend coffee (B50), served with a side of condensed milk, or a hot tea served in a Chinese-style ceramic cup. They are also renowned for their signature kai kata set (B85), a pair of fried eggs served in an aluminum pan with Chinese white sausage and a crispy baguette. Standing its ground amidst a growing sea of hip openings, this cozy 60-year-old shophouse cafe can’t be beaten for its surprisingly inexpensive traditional coffee (B11). Here, both tourists and locals—especially elders—come to enjoy toast with tasty homemade kaya custard (B30) or soft-boiled eggs (B12) served in egg cups. 212 Chakkraphatdi Phong Rd., 02-281-2134. Open Mon-Fri 6am-3pm, Sat-Sun 6am-2pm. Having been passed down from generation to generation, this 90-year-old coffee shop stubbornly rejects modern concoctions like cappuccinos or espressos in favor of classic and simple freshly brewed coffee with condensed milk (B25). You can order toast (B30) and soft-boiled eggs (B20), sit back in an old wooden chair and enjoy watching as Thai-Chinese elders gather to chew the fat. This tiny coffee kiosk isn’t your typical boring sidewalk stand. Open for nearly 40 years, streetside seating comes in the form of green and pink plastic chairs, where customers sip on black hot coffee (B15) and munch on toast with butter and condensed milk (B20) while watching the morning traffic roll by. 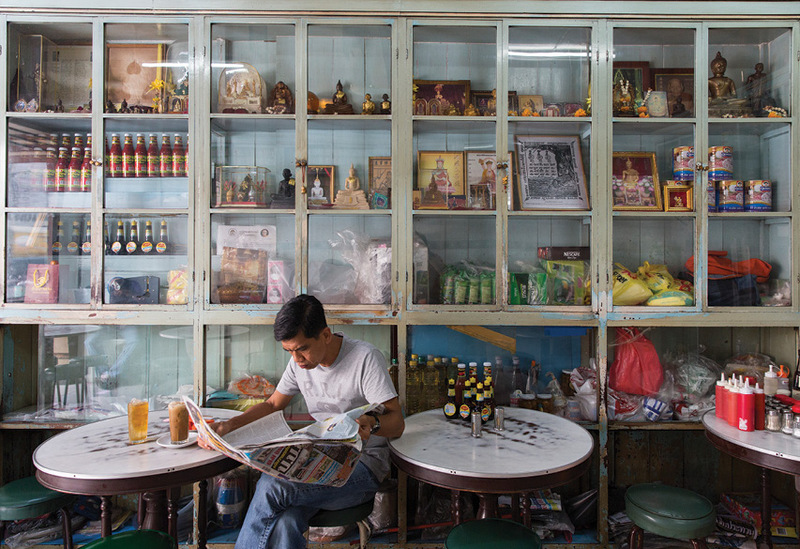 This old-fashioned shophouse cafe has been around for more than 90 years. Run by a Hainanese-Chinese owner, they serve traditional Hainanese-style brewed coffee (B17), soft-boiled eggs (B18) and toast (from B10), with no English menu in sight. The eclectic crowd can span anywhere from Teochew Chinese uncles to chef’s taking a break from Yaowarat’s fancy restaurants. 163 Phat Sai, 083-441-4111. Open daily 10am-11pm. Standing strong for more than 80 years, this spot has a loyal following who come for the egg custard bread (kaya, B28) and Thai-style American breakfast (from B50). The no-frills decor only adds to the charm, with wooden cabinets filled with tins of Milo from the ‘80s adding to the good-old-days vibe. To drink, coffee with milk starts from B22. If you’re driving, you can park at The Old Siam or Saranrom Park and take a stroll through the Old Town.